DiabloFans Wizard builds => Enter the item's name under "Has Item" and hit "Filter"! - vitality for AS 7%? - vitality for elite damage? Moved to the correct thread. I'd say do not touch it for now, it's awesome and usable and there's no reason to potentially "destroy" it now by making a hasty re-roll decision. My guess would be vitality for elite damage, but that's trading toughness for a small damage boost - and especially at this phase of the season when it's about gearing I'm not sure that's the smartest thing to do. So keep it as is for now. yes..it seems a wise decision. 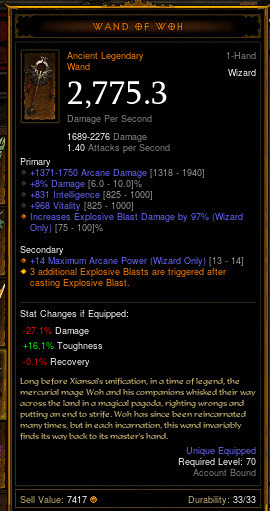 Hi, should I reroll vita or 10% CDR for socket? Probably CDR, don't think it's really crucial for any build. And you're gearing up anyways, so it doesn't matter - you will replace this wand rather sooner than later. after 200 rare wand upgrades I've found this aether walker. For delrasha build should i keep vitality or cdr? I will roll %10 dmg on it. I think cdr is more valuable. @ztnEST: Are you sure about that? I think the damage increase of AD might be quite large as well. I'm thinking it might be better to roll up the EB damage from 83% to 100% (if possible, I'm actually not sure if that's re-rollable). @LaBalius: I probably wouldn't re-roll it just yet, but seeing as it's 4 days old, I wonder what you did? Also, moved this to the re-roll thread. What should i roll here, Int off in the future? And for now go AD? i remove ad from other items and put Aspeed instead? Any differences if i want to go solo or group? 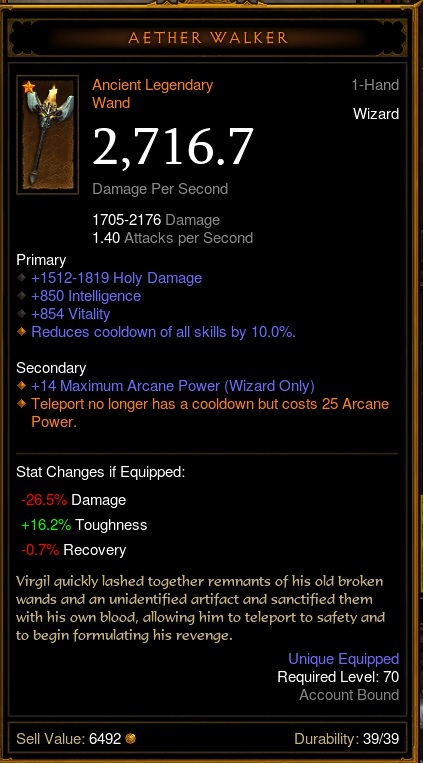 Should I roll the (Ancient) Vitality into some sort of Crit Damage or chance or should I keep the ancient boosted Vit? Just got a compass rose that rolled with 20% area damage. DMO AO wizard. Question is should I reroll for crit chance. I'm leaning towards keeping the area damage personally. So, I just managed a GR72, though I've been close on GR73 as well (missed with 50seconds on a good run, some 20 paragons and 2x leg' gem enchants earlier). I find myself wondering if I've rolled the gear I have in the best way possible. You simply have to play with the gear you get, but sometimes a second opinion on what to make of it, can help a lot. Appreciate any and all good advice on how to get further. One obvious thing is to get the Halo up to 6% CHC, but the rolls haven't been in my favor on that one (it took like 30 rolls just to get from 5% to 5.5%, and then I went low on mats for a while). Also, if someone would like to estimate what GR-levels I should be able to manage with this build, it would be awesome input as well. Just looking for some overall guidance.. I'd appreciate the help. I can't seem to take any damage and I know that I am missing the Compass Rose to get the 2-piece and that my gems are a low level right now. Just looking to get shown the direction to go in. Roll the area dmg to 10 %, or the intelect to 10 %? I was thinking of rolling the int to 10 % for more dps end game..
what to reroll here guys?? 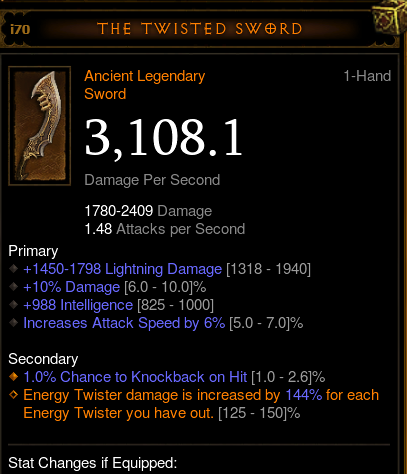 I think i am can use it for Flashfire t10 farming? should I replace X-X dmg or int to max dps?